CGHS Pune recruitment 2017. Available posts are Pharmacist (Allopathy), Pharmacist Homeopathy, Pharmacist Ayurvedic, Lab Technician, ANM, Nursing Officer, Lady Health Visitor, Dental Technician and ECG Technician. Online applications only accepted for this CGHS Pune recruitment 2017 notification from 04-11-2017 to 04-12-2017 via the official website of https://cghsrecrutiment.mahaonline.gov.in/. Candidates will be selected based on written test or interview and merit in educational qualifications. 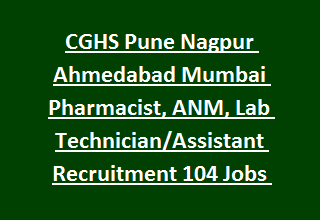 More details for these CGHS Pune vacancies are given below. There are total 104 vacancies in this Central Government Health Scheme jobs recruitment 2017. Age limits are applicable as per the government norms. For ANM jobs-Diploma in Female Health worker is required. For Lab Assistant 10+2 with Science group qualification is required. For Lady Health Visitor, Dental Technician jobs refer official notification. Pay scale will be Group C level only. Candidates will be selected based on merit in qualifying examination and interview or written test. For all shortlisted candidates documents verification is mandatory. At the time of document verification candidate has to bring the original documents. Candidates who willing to work with CGHS in Pune or Mumbai or Ahmedabad or Nagpur they can submit their application form online from 04-11-2017 to 04-12-2017 through CGHS official website of cghsrecruitment.mahaonline.gov.in.